Leading off today: If common sense prevails, tomorrow's games at Cool Insuring Arena in Glens Falls could mark the last time for very many years that the Federation basketball tournament is held outside the metropolitan New York area. The New York State Federation of Secondary School Athletic Associations solicited bids last year for the tournament contract for 2020-22 and accepted Fordham University's proposal in December. "Seventy percent of the teams in a year-in, year-out basis are from a 30-mile radius of New York City. The shame of it is when they go upstate and it's supposed to be the climactic ending to their season and there are 300 people there," said Mike DePaoli, an assistant men's basketball coach at Fordham who was instrumental in landing the tournament. "Last year's Stepinac-LuHi game, if that's happening in our gym it's sold out a week before. That's the kind of experience we're hoping the boys and girls can have here at Fordham." Said Christ the King boys coach Joe Arbitello: "It's a miracle to me that he was able to get it done. We have played in the Federation six times in the last 11 years. It has always been a let down because of the lack of attendance. We would travel 300 miles to play a team located 10 miles from us. Now that it's at Fordham that game will be so much more important." Monoco retires: After 40 years of basketball in the college and high school ranks, Al Monaco has coached his last game. Monaco made his reputation at Williamsville South, where he had a 364-211 record in 24 seasons as the boys basketball coach and led the Billies to Section 6 titles in 2010 and '11. He was forced out in 2012 and moved on to the collegiate level as an assistant with Fredonia State. Most recently he accepted as the Villa Maria women's coach, going 83-22 as the school restored its sports programs. "I always wondered when I would know if the time was right, but I'm comfortable and happy to say I do know that time is now," he said in the release announcing his retirement. On the move: Damian Saks, former Horseheads football coach and current assistant principal at Elmira, will take over as the athletic director at Corning on April 22. Saks replaces Bill Pierce, the first AD in Hawks history. Pierce is ending a six-year stint to take over as the assistant superintendent for school operations. "You can't think of a better scenario than having a guy that's walked in your shoes that's right there in the district to call when you have questions," Saks said. "It's a perfect scenario to have someone with Bill's experience and expertise. He's done a phenomenal job with Corning." • Fifth-year Moore Catholic AD Gela Mikalauskas will retire at the end of the school year and be replaced by boys basketball coach Kyle McAlarney, who plans to continue coaching. Joining the ranks: Emily Durr, the state player of the year for Utica Notre Dame in Class B in 2014 and a five-time all-state selection, has been appointed the women's basketball coach at Mohawk Valley Community College. Durr went on to play at Iowa State, where she appeared in 122 games and played in a pair of NCAA tournaments. She averaged 12.7 points a game as a senior. At Notre Dame, Durr scored 2,445 points and lead her team to NYSPHSAA and Federation titles as a senior. 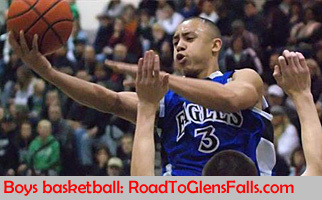 More reading: My column for PressConnects.com delves into the question of whether Glens Falls star Joe Girard III was born two years too early. If it seems like a strange question, take a look at the column to for the explanation. Sentenced: Jamesville-DeWitt basketball star Teleak Robinson, accused of a string of crimes in 2018, pleaded guilty to the top charge last week and will spend weekends in jail, five years on probation and get his record sealed, The Post-Standard reported. Robinson, 17, pleaded guilty to a felony strangulation charge. As that case was still in its early stages, Robinson was charged with participating in a robbery in September. And in December, he was charged a third time with driving a stolen car. The robbery and stolen property charges were satisfied by Robinson's plea to the strangulation charge before County Court Judge Thomas J. Miller.